Ustad Hotel had been on my list of films to review, so I said I would, but what with one thing and the other, I just never got around to writing it up. Until recently, when my son brought back his PS3 player for us to use and my husband decided to see if we could watch non-BluRay films on it. He popped this film in, and we watched it all over again. Abdul Razaq (Siddique) is over the moon because his wife Fareeda (Praveena) is pregnant with their first child. He shares his dreams with her - the child will be a boy; he will name him Faizal and affectionately call him 'Faizee'; when he grows up, his son will help him in his business, and with experience, he will take it over and expand it... Only, the longed-for son is a daughter. Bitterly disappointed, Abdul decides to try again. And so, the next year, Fareeda is back in the hospital - only to give birth to another daughter. The scenario duplicates itself the next couple of years. Now the father of four daughters, an irritated and disappointed Abdul leaves his pregnant (once again) wife behind and migrates to Dubai, where he decides to set up a hotel business. So he is not around when Fareeda finally gives birth to the long-awaited son - Faizal. But the frequent pregnancies and the emotional stress of not delivering a son take its toll on Fareeda and she dies leaving behind five young children. A grieving Abdul takes his children with him to Dubai where, little Faizee is well and truly gushed over and spoilt by his four (not-much-) older sisters - Fatima, Fouzia, Feroza and Fazeeha. The girls took care of the house, and young Faizee is very helpful indeed. Only, his father cannot bear to see him doing 'woman's work', as he calls it. He has his son's life all mapped out. The girls don't really matter. One by one, the girls are married off, and soon Abdul himself marries again, much to Faizee's chagrin. When Faizee grows up, Abdul decides to send him abroad for his higher education - hotel management, business administration, whatever his son wants to do, wherever he wants to go. What Faizee does not dare tell his father is that he wants to be a chef. He has always wanted to be a chef. And so, he engages in a bit of duplicity. He cons his father into thinking that he is going to the University of Lausanne in Switzerland to do his hotel management. Instead, he joins a culinary course. When he finishes, he is not only an accomplished chef with an offer of the post of Sous-Chef in a prestigious hotel in London, but he also has a firang girlfriend. His only hope is that his Ithaathas (sisters) and company, will protect him against his father's wrath. His sisters are non-plussed. They know what their father's reaction will be. In any case, matters are taken out of their hands when their father sends Faizee a telegram stating he is ill. When Faizee meets Shahana (Nithya Menon), under the watchful eyes of her many family members, she tells him candidly that her family is very orthodox, but she is not. She fully intends to work after marriage. She is doing an interior decorator course, and has no intentions of staying at home like a good married woman. Would he allow her to do the interiors of the new hotel that his father is building? Faizee is equally candid - he is not going to be running the new hotel, or any hotel at all. He is a chef, and is soon leaving to take up a job in London. 'Chef'? As in 'cook'?! The news sends shock waves through Shahana's family, and the proposal falls by the wayside. Abdul is beyond furious, both at the humiliation he suffered at the hands of Shahana's family, and at the insult Faizee offered him and his dreams. He, Abdul, had spent years, decades, living down the stigma of being a lowly cook's son. He began the hotel business so he could be referred to as the hotel magnate. Instead, now, he will be referred to as a cook's father. As the argument escalates between father and son, neither are willing to compromise, and finally, Abdul decides that the time has come to end his son's luxurious lifestyle (and one in which he does what he wants to, regardless of consequences) that is dependent on Abdul's hard-earned money. He takes away Faizee's passport and his credit cards, effectively stopping Faizee from travelling to London to take up his job. An equally angry Faizee decides to leave home, but is practical enough to steal some money before setting out. (Strangely enough, he does not take his passport though it is in plain sight. I would have thought that would make more sense.) Without a passport, the only way he has to get out of Dubai is to pay one of the fishing boats to take him to coastal Kerala. With the help of his father's chauffeur, Faizee soon lands up at Kozhikkode, and is handed over to his grandfather, 'until his father gives up his passport'. Faizee's grandfather, Karim (Thilakan), runs a restaurant on the beach, called Ustad Hotel. He runs it almost like a cooperative, not worrying too much about the profits. With nothing else to do, Faizee begins to help out. It is frustrating to him that his grandfather will not allow him to cook. After all, he is a trained chef. Karim is not so sure. Can you make a Malabari paratha? he asks Faizee. Much to Faizee's discomfort, he cannot. So Faizee starts as a menial employee - delivering take-out orders, cleaning up the tables after the patrons leave, washing dishes... and in the night, Faizee practices making the special parathas, night after night, until he succeeds. Karimikka has been watching his grandson, and eventually, tells Faizee to go to the five-star hotel, Beach Bay, nearby and meet the chef. Tell him Karimikka sent you and give him this note, and you will get a job, he tells a disbelieving Faizee. Nevertheless, Faizee does go to meet the Chef (Maniyan Pilla Raju), and is pleasantly surprised to be given a job in the kitchen on the spot. (His grandfather lets him into the secret when he returns.) The hotel, which is hosting a Fusion Food Festival, also gives him an opportunity to impress the judge, a visiting chef from a prestigious Parisian hotel. But he soon runs into trouble - the chef, Babu, is not above taking credit for Faizee's creations, or allowing him to bear the brunt of a customer's anger. Coincidentally, the customer is Shahana's fiance. Shahana is embarrassed by his behaviour, and sincerely apologetic, but Faizee is too angry to care. Soon, there is another contretemps, with the hotel manager this time, and Faizee is fired. He goes back to working at his grandfather's restaurant, all the while hoping that his father will relent and send him his passport. In his spare time, he also hangs around with a rock band that's trying to make it big. They invite him to a gig, and he is surprised to find that their lead singer is Shahana. When the programme is over, the rest of the band are sloshed, and he ventures to offer to drop Shahana to her paying-guest quarters. An unwilling Shahana is forced to agree as her companions do not look like they can walk, much less drive. They set off, Shahana in a burqa much to Faizee's amusement, only to have the ancient van (belonging to his grandfather) break down. A few (mis)adventures and a better understanding later, they reach her residence and he is taken aback when she matter-of-factly asks him to give her a boost over the compound wall. Her local guardian has no clue that she sneaks out at night to be a part of a band. In the meantime, Karimikka, who had mortgaged his restaurant earlier, is finding it difficult to make the payments. Faizee finds out the the bank is in collusion with the owner of Beach Bay hotel who wants to expand his business, by buying out the restaurant that stands on prime beach property. Faizee's intervention in the matter only escalates the issue, and soon, the owner retaliates. He has his minions lodge a complaint with the local health department, and soon, the restaurant is shut down citing unhygenic conditions. The local media, acting on 'tips', are quick to hype the case. Karimikka is a broken man, but the employees, who consider the restaurant much more than just their place of employment, contribute to the renovation of the restaurant. When it opens, with Shahana's help, the newly-revamped and health inspection-passed restaurant is a huge success. The bank manager is foiled when Karimikka and Faizee repay the loan and interest. Much has happened in the interim. Faizee has broken off with his girlfriend abroad, his father has come down to see him cleaning the tables and they'd had another argument, Faizee and his grandfather have had several heart-to-heart conversations about love and life, and how to brew the perfect cup of black tea, Karimikka tells him his ideal definition of a chef... and Faizee has received an offer from the visiting French chef to join him at his restaurant in Paris. Karimikka does not say a word. He requests Faizee to undertake one last trip, to deliver a cheque personally to a friend in Madurai. He does, and receives an epiphany that just may change his life. However, his grandfather is now critically ill. The road forks in front of Faizee and it is up to him to decide what to do, and where to go. At stake is not just his career and his ambition, it is also his burgeoning love for Shahana, the fate of several employees who call his grandfather 'Ikka' - brother, and who have given their life savings to saving the hotel. It is also the call of his conscience, and the maturity to choose not just what he desires, but what is right. Ustad Hotel first gained notice because it starred Dulquer Salman, son of one of Kerala's ruling superstars - Mammootty. On the face of it, it didn't seem much of a 'star' vehicle. Coupled with the fact that Mammootty was still going strong as the leading man (his film Thappana was running to packed houses in the next theatre at the same time), many people wondered, aloud, whether the boy was committing professional suicide before his career even began. The film released to both critical acclaim and box-office success, and proved that whatever his antecedents may be, Dulquer was content forging his own path, on his own terms. 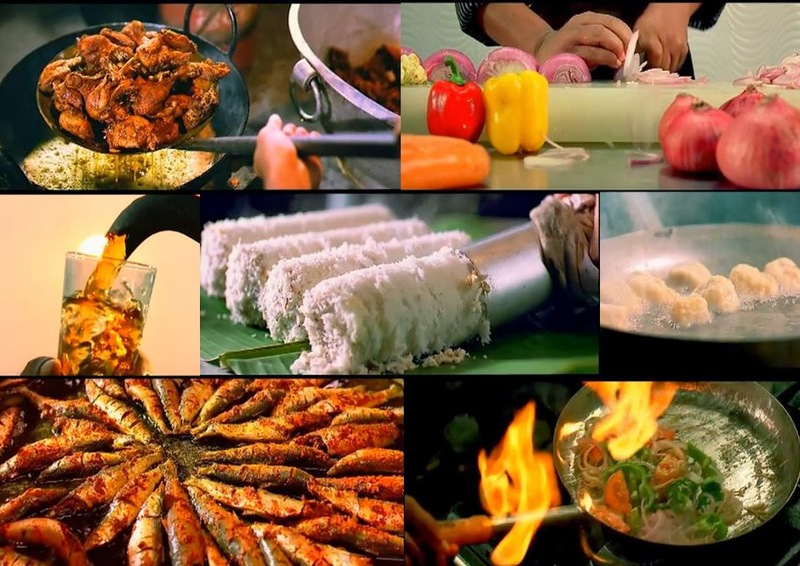 After Salt and Pepper, this is the second film to focus on food as an integral part of its story. Apart from that common ingredient, both films were as different from each other as, well, chalk from cheese. While Salt and Pepper portrayed a more mature love with a couple who bonded over food, Ustad Hotel was a young man's journey towards self-realisation, in which food plays a very, very important role. He is a chef; his grandfather only acknowledges that he can cook when he learns to make the perfect Malabari paratha; his grandfather's little restaurant is famous for its biriyani, which is sold as a signature dish in a five-star hotel nearby (its chef taking the credit); there's a discussion on suleimani, and how to make it; there's a rockband named Kallummakkai (Mussels), even a song that sings of a mother-in-law making food for her son-in-law (the marriage of traditional and modern is seen here as well - the song, originally, is a mappila paatu (traditional Muslim wedding songs) set to rock beats) - food is everywhere, from the veritable feast spread out before Faisee when he goes to 'see' the girl to the many scenes of cooking, and conversations over food, about food... It's a warning not to watch this film when you are hungry. Is it perfect? No, not really. It is a rather uneven journey, much like that of Faizee's himself, and stumbles occasionally. It also falls into the trap of sermonising a couple of times, until you are forced to say, We get it, we get it! The last segment of the film, particularly, was a disappointment to me, inasmuch as there is definitely a reverse snobbery in place. 'West bad, India good' is a trope that should have gone out with the dodo. Especially today. It just wasn't necessary - the foreign girlfriend of the protagonist, for example; it seemed even more egregious considering a woman wrote the script. Why buy into that caricature? Women really are our own worst enemies. A MacGuffin in the shape of the character based on Narayan Krishnan of the Akshaya Trust? Eh, I would much rather have done without the sanctimony. The episode itself is heartwarming, no doubt, but it is drawn with such a heavy hand that one wondered where the director of the first half of the film went. It was also a sore point that ambition is somehow seen as a negative characteristic, and somehow it is wrong for a young man to aim to make something else out of his life. People make choices all the time, I get that. Life does not always go the way you plan. But there was not enough development in Faizee's character to make that choice organic. It seemed more of the director's (or script writer's?) vision that someone who wants to go take up a good job abroad is somehow not quite as noble as someone who chooses to stay in his hometown. That underlying 'tone' of the movie, coupled with the characterisation of the firang girlfriend as someone who sleeps around left quite a bad taste in my mouth. (Pun intended). Also, there is too much of a hasty (and convenient) 'Let's tie up the loose ends' feel to the plot, and it seemed like the director had completely forgotten they existed until the very last minute. That said, I did like the film a lot. It helped that none of the characters are wholly good, or wholly bad. They are selfish, they are loving, they are caring, they are indifferent... they are human. They are people that you identify with, circumstances that may seem familiar, dialogues that you may have heard, or said yourself. That, and the top class acting. The late-veteran Thilakan stands head and shoulders above everyone else in the cast. He is the grandfather, who is better equipped to deal with his grandson. He has learnt from the mistakes he made as a father, and is not shy of admitting that he was at fault. He is practical, he is understanding, and he is empathetic. Young Dulquer Salman not only proves he has the intelligence to choose very different scripts, but is definitely a chip off the old block when it comes to acting talent. It is hard to stand up to Thilakan in a scene, as many senior and highly talented actors have found to their discomfiture, but Dulquer does a good job of it. It helps that the relationship on-screen is that of grandfather-grandson, perhaps. He is very believable as the spoilt young lad, brought up abroad, who has to destroy his father's ambitions in order to achieve his own dreams, and who learns a few life lessons along the way. He is self-centred, though not a bad soul at heart, and is willing to make amends when shown the error of his ways. Siddique plays the most unsympathetic character in the film. As the father whose longing for a son eclipses everything else, his plight when his dreams lie shattered at his feet is devastating. He played it with just the right touch, stopping his character from becoming a caricature, and instead, investing it with just the right amount of pathos underlying the selfish ambition. The director also treads lightly (mostly). There is a fine balance between making this a feel-good movie with a social message, and one that degenerates into melodramatic sermonising. While there is a bit of sermonising towards the end (sans the melodrama), he has managed to bring out the colour and flavour of a generational rift without letting the characters run riot. This may also perhaps be the first film in a long time where the characters belong to a certain community - the language and the ethos are all Malabar Muslim - but religion itself doesn't play a role in the film. It is what it is - a story that could happen anywhere, with anyone. That the characters are Muslim are just by the way, but the script is not lazy on account of that. It accords a respect to that background that is rarely seen within the commercial format. It follows the ambience, the cultural ethos, the food and the typical conversation with remarkable accuracy. (Some of the characters were slightly off with their pronunciation, though, and that should have been caught, in my opinion, during the rushes.) Writer Anjali Menon is from Calicut (Kozhikkode), and is familiar with the place and the milieu of which she writes. The fact that Anwar Rashid, the director, is a Muslim himself, allows him to poke affectionate fun at his own community, laughing at their foibles and follies, and the scenes with the sisters, for example, are delightful indeed. It is all done with good humour, and he mostly steered clear of any stereotypes, whether good or bad. I think you have a hand in that, Anu, having introduced me to Babette's Feast! *grin* And if you thought Babbette's Feast was about food, then you should really see this, Madhu. I swear to you that you can count on your fingers when the characters are not cooking, eating or drinking something! Plus, the colours! To me, there is nothing in this movie from a 'great cinema' perspective; It is just a good movie - of the sort we are used to seeing in the 70s/80s. But then the fact is that from the latter part of the first decade of the noughties, Malayalam cinema has been changing. New themes, stake holders and techniques are slowly but surely pulling it out of the super star morass. And movies like this have played a good part in that transition. One would also see a surfeit of talent from the muslim community making their mark in directing movies. Ashiq Abu, Anwar Rashid and their ilk are all in the business of making good Malayalam cinema now. More themes have a muslim angle, much more that what was visible (having said that one would also find a fair representation of the christian community too, Amen, Romans etc). So, for me this film worked. An unabashed Tilakan fan that I am, his work was gold standard, and that notwithstanding, the movie held me down to the seat for its duration and I could see sensible stuff back in Malayalam cinema. While Nitya Menen (she has been numerologically upgraded from a simple Menon) and Dulqar rode along - not much by way of acting - the supporting cast won it for me. They have done an amazing job. So, here is to a new phase of Malayalam cinema. Note to the blogger: Watch Amen, if not already. That one is the closest I have seen where the idea of magical realism has been given form. A review would be welcome too - "maybe an opportunity for some verbal jousting" as Inspector Clouseau says. Did I say the film was 'great'? :) I agree. It is a good film, and we have grown up with films such as these. But it was refreshing to see it happen in an industry which had been taken over by the Superstar syndrome. I agree wholeheartedly with you that the film keeps one engrossed throughout. I didn't know about Nithya's mumerological upgrade; thanks for mentioning it. :) I did think Dulqar was good, though. Watch Amen not for Fahad, but Indrajit; he is the star. And well, I am not a fan of Fazil Jr. He can pull off roles in the straight and narrow that he is capable of. Fluff beyond that. Let him not deter you from a lovely film though.